One of the least fun feelings while playing an army that relies on combat is watching your army get shot to death while feeling like there is nothing you can do to stop it. However, with the right list design and game plan, you can overcome the range advantage of your opponents. In this article I aim to demonstrate ways for you to take the fight to your gun line opponent and win consistently. As you can see, their army is in the top right and you are in the bottom left. I marked a common objective placement in yellow and the shooting army’s danger zone in red. 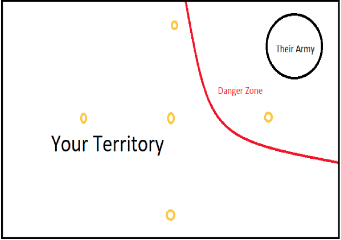 The danger zone is an incredibly important concept in this matchup, it is the no man’s land the shooting player has to set up in order to protect themselves. None of your units are allowed to live in this area or they could dive the center of their army and set up for more threats to follow. Usually cheap screening units like guardsmen are set up along the red line to prevent deep strikers and other threats from getting too close. Your opponent has to ball up in order to decrease the size of the danger zone they have to control. A spread out gunline overextends screens and gets picked apart piecemeal by an aggressive army. What this means is that, as the aggressor, you functionally have control of 65-70% of the board from the start of the game. That is your biggest advantage. As the aggressive player you feel like you have to go in on your opponent’s army and quickly or you will lose. That is not true. Because you have control over the board early, if you can avoid being tabled, you will win the game purely off of having more objectives than your opponent turn after turn. Playing cagey against a long range opponent who was expecting you to get aggressive and allow them to table you is a very successful tactic. Now surviving the shooting onslaught is no small task, so how do you go about that? Terrain features are outlined in black. Safe territory is marked in green and areas where you can be shot are marked in red. See the board in terms of safe and dangerous territory and always be conscious of what units you’re allowing your opponent to shoot. The safe areas are where you will play most of your game. The star marks the most important location on the board, one far more important for you to control than any objective. It is the closest location to your opponent that is out of their line of sight. If you place a powerful close combat unit on that star, your opponent will be pinned into the corner, unable to leave for fear of getting tabled in close combat. In addition, this location is where you should stage any attacks on their army you decide to make. 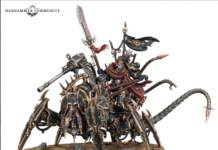 Like a chess player moving a piece to a location to set up an attack on a different spot on the board, first put your combat unit on the star and then assault your opponent later. Their screen has a gap where it’s only one layer deep and a target unit that is a little too close. This could allow you to punch through the far right unit and use a fight twice stratagem to move another 6” to surround the circled target. This is a game ending play as you will survive to kill the target during their assault phase and start your turn inside their army. If you know what to look for on attack, you will see defensive flaws of this sort and be able to exploit them. Very few defenses are perfect, even at the highest level of play. Spend a few minutes examining your enemy’s defenses before attacking to look for weaknesses and you will begin to have more successful assault phases. 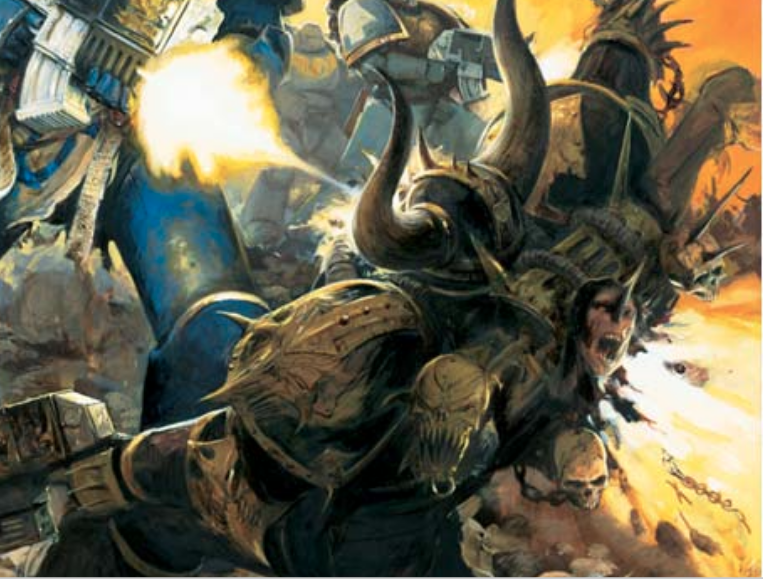 All in all, the key to playing against a gunline army is to keep your head while getting shot and not overreact. Don’t be afraid to play cagey even if that doesn’t seem like what your army is “supposed” to do. Abuse line of sight blocking terrain to avoid shooting. Start winning on points and force your enemy to come to you, on your terms. However, if you have to charge your opponent, similarly, don’t go crazy. Your goal is to get to their shooting units, not just kill random screening units. Move in and try to stay safe in order to set up devastating charges for the following turn. Close combat is a harder play style than shooting but much more rewarding to master. These techniques give you tools in matchups that feel hopeless. Now, go table some guard. 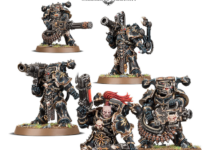 As always a big thanks to Games Workshop for the featured image used!